Summary: Recently, under strictly audited by State Administration for Industry and Commerce, China Transport Intelligent Vehicle Co., Ltd which invested by China Transport Group, was successfully registered and approved as non-regional enterprise with initial China, the company mainly covers UAV, intelligent robots, new energy vehicles, machinery and equipment manufacturing, sales; goods and technology import and export business. 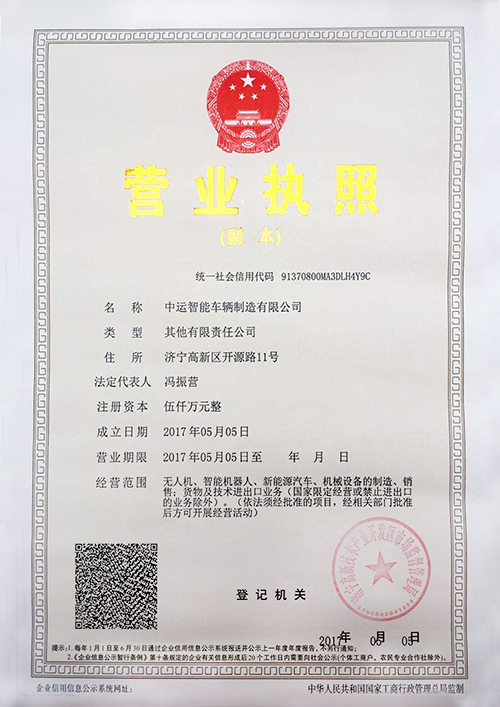 Recently, under strictly audited by State Administration for Industry and Commerce, China Transport Intelligent Vehicle Co., Ltd which invested by China Transport Group, was successfully registered and approved as non-regional enterprise with initial China, the company mainly covers UAV, intelligent robots, new energy vehicles, machinery and equipment manufacturing, sales; goods and technology import and export business. According to China's Enterprise Name Registration Management Implementation Measures, the registered capital of non-regional enterprises should be no less than 50 million yuan, and must go through the strict supervision of the State Administration for Industry and Commerce in order to use the name of the enterprise without administrative divisions. No regional enterprises in theory, has no clear regional attributes, is a true combination of multiple capital, currently, in some developed countries, diluting the enterprise's regional attributes has become an important trend. In recent years, China Transport Group completes the industrial layout in the e-commerce, cross-border e-commerce, intelligent equipment manufacturing, modern agriculture, intelligent logistics, software research and development industries such as large-scale, professional and "Internet +", and has made outstanding achievements in the integration of information and industrialization, information technology, intelligent equipment manufacturing, achieved a steady increase in operating efficiency, has been widely recognized by the community, established a good brand and great influence for the Group . The establishment of China Transport Intelligent Vehicle Co., Ltd., with no regional restrictions, enterprise development space will be more broad, has great significance for the company to expand the global smart vehicle market, enhance brand awareness, diversified business! The next step, will be the formation of intelligent vehicle generation workshop in the country, adopting foreign advanced technology, R & D and manufacturing for China's intelligent vehicles, has a positive significance for the occupation of the global self-vehicle market by Chinese intelligent vehicle industry. In the future, we will invest more resources for the integration of resources in the "Internet + Intelligent Manufacturing", and constantly improve brand building, enhance market share of high-end intelligent vehicles, speed up the co-ordination of internal and external resources of intelligent industry, and take this as an opportunity, further consolidate the cornerstone of China Transport Group brand, lay a solid foundation for international brand of China Transport, to better promote global brand strategic and achieve full realization!